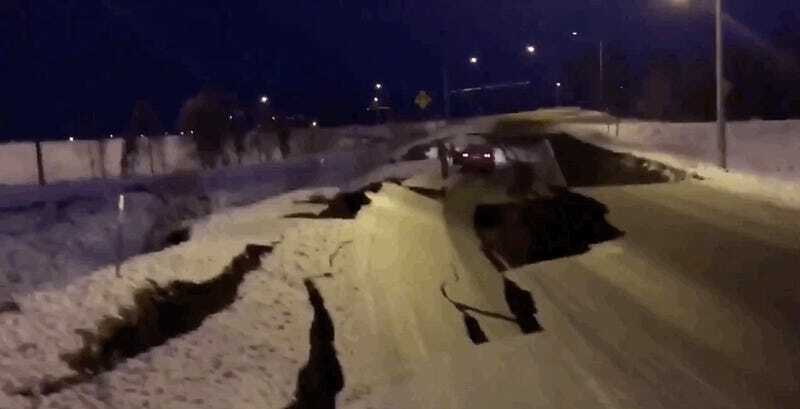 Roadway damage in Alaska following a magnitude 7.0 earthquake outside Anchorage. A magnitude 7.0 earthquake shook Anchorage and the surrounding area on Friday morning. The shaking also triggered a wave of tsunami warnings along the Alaska coast with more likely around the Pacific. As of 9:59 a.m. local time, the tsunami warning has been cancelled for Alaska. The strongest of a series of quakes struck just after 8:30 a.m. local time about 8 miles north of Anchorage. Numerous strong aftershocks continue to jolt the region, with Alaska’s Earthquake Center tweeting that ‘many more’ are expected. In the immediate aftermath, reports on social media indicated there are power outages, collapsed overpasses, fires, and sinkholes, though as with all disasters, it’s worth waiting to hear more official information. The earthquake also triggered a tsunami warning for Cook Inlet and the Southern Kenai Peninsula. “For other US and Canadian Pacific coasts in North America, the level of tsunami danger is being evaluated,” the U.S. Tsunami Warning System said in a bulletin. The warning has caused widespread gridlock as Alaskans fled the coast while navigating roads that have reportedly been damaged by the shaking. Alaska is no stranger to earthquakes, with its southeastern coastline sitting on the edge of the Pacific and North American tectonic plates. The state recorded the strongest earthquake in North American history in 1964. That magnitude 9.2 earthquake caused widespread damage and unleashed tsunami waves across the Pacific, including one that reached an astounding 200 feet in height as it funneled. This quake wasn’t nearly as strong so any tsunami is unlikely to reach that level, but this is still a dangerous situation and should be monitored closely if you live anywhere across the Pacific. For official information in the U.S., visit tsunami.gov. Update 2:08 p.m. ET: The tsunami warning has been cancelled for the Alaska coast but other areas should remain vigilant.